ONE OF THE BEST PRICED PRIVATE HOLIDAY APARTMENTS ON OFFER RIGHT ON CAVILL AVENUE IN THE CIRCLE ON CAVILL RESORT CALL NOW!! STAY SUNDAY TO FRIDAY FOR AMAZING DEALS MOST WEEKS OF THE YEAR!! THIS IS PAYABLE AS CASH ON ARRIVAL TO THE REPRESENTATIVE WHO COMES OUT AFTER HOURS TO MEET YOU AND CHECK YOU IN. Wireless Hot Spots in the area for a very cheap alternative to some expensive internet options whilst on holidays!! Water sports depart here from the jetty, Jet boat rides, dinghy hire, river cruises and more. 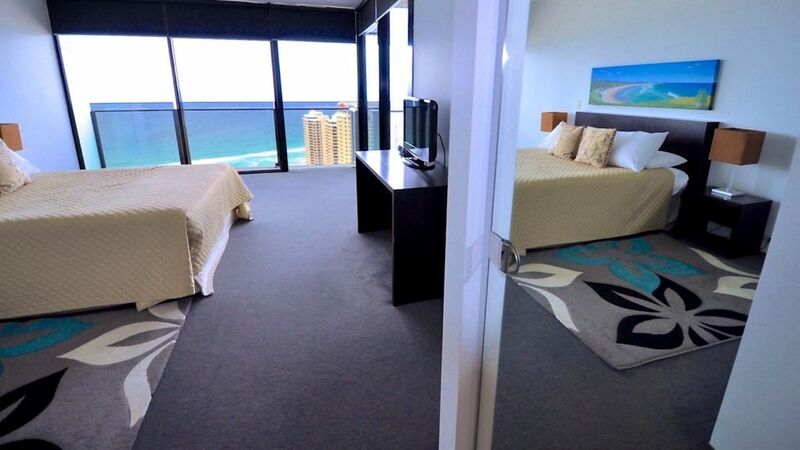 Our private apartment is in the Circle on Cavill building and located at 9 Ferny Avenue also on the corner of Cavill Avenue and Ferny Avenue in Surfers Paradise on the Gold Coast. New Tram line runs directly outside the resort and travels from Broadbeach to Southport and beyond. Surfside Buslines provide daily scheduled services between major Gold Coast suburbs and Surfers Paradise for nominal fares. Busses operate from the Surfers Paradise in all directions. Daily Queensland Rail train services operate between Brisbane Airport (domestic and international terminals) Brisbane city, and the Gold Coast with bus connections to Surfers Paradise. The largest taxi company on the Gold Coast is Regent Taxis, operating between Surfers Paradise and all the main areas on the Coast and Brisbane. Limousines are a novel and cost-effective method of travel for groups over longer distances. They are often booked by travellers for airport transfers. Surfers Paradise is situated on the Nerang river with access to various water transport options. Driving to Surfers Paradise, the M1 Pacific Motorway provides easy north / south access. From Sydney, you take the the M1 Pacific Motorway north, automatically connecting with the Gold Coast highway at Tugun which leads directly to Surfers Paradise. From Brisbane, you take the the M1 Pacific Motorway south, towards the Gold Coast and exit at the Smith Street Exit 66 and follow the signs to the Gold Coast highway to Surfers Paradise. Very spacious loved that it was 38 floors high. But disliked that its advertised as a 3 bedroom when it should be 2 bedroom plus an open study. But apart from all of that very nice room good location very central. Huge, spacious apartment with excellent views. Very clean and well organised. We really enjoyed our stay on the 38th Floor of Circle on Cavil, Surfers Paradise. Apartment was huge, clean and well kept. Great spacious place, amazing views, would stay here again! This was a great apartment, very affordable and comfortable. Only concern was with the beds in the study, window coverings not dark enough, woke up very early. Location is excellent, just step outside the door and you have everything you could possibly need.